It’s important to teach kiddos to always say “thank you,” but it’s easy to forget to stress how actions can speak louder than words. Little ones can both say “thank you” and live by these words through writing special “thankful” notes for their loved ones. 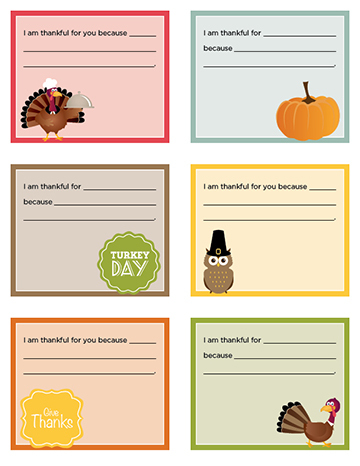 They can personalize these Thanksgiving-themed notes with messages to friends or family members. Sit down with your kiddos and ask them why they are thankful for the special people in their lives, and work with them to turn their feelings into a heartfelt message. You can even set a good example by writing a note to someone special in your own life! Just click the image below to view the printable version of the notes.